While all decontaminating agents are by nature dangerous, chlorine dioxide (CD) gas has many traits which make it the safest method available. The best safety feature with CD is that it is self-alerting. Chlorine dioxide gas has a discernible odor at safe levels, allowing you time to shut down the system and address the situation safely if it is smelled. 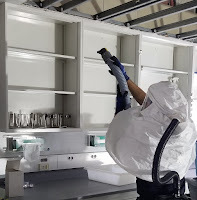 Other agents, such as Ethylene Oxide (EtO) and Vapor Phase Hydrogen Peroxide (VPHP), cannot be sensed until you are exposed to extremely high concentrations. This dangerous trait is why natural gas is given a sulfur-like odor additive, to act as an alert. VPHP users (and surrounding colleagues) become aware of a harmful exposure only when coughing and choking occurs, therefore a reliance on external sensors to prevent adverse health effects is more necessary. With CD, this need for external equipment is not as strong because of its odor. CD has an odor threshold at or below the 8-hour Time Weighted Average (TWA), so the user is self-alerted to exposure at a low level and the reliance on external sensors is not as imperative as it is with VPHP. This makes CD safer for both the user, and any surrounding personnel who may be working nearby. Visit our Safety page to learn more important differences between chlorine dioxide and hydrogen peroxide.